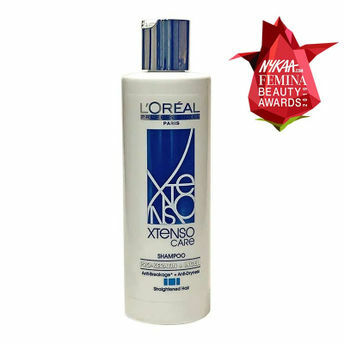 Developed especially for the chemically treated hair, this L'Oreal Professionnel X-Tenso Shampoo keeps the excess oil at bay. The Pro-Keratin In cell technology rebuilds the hair fiber while the botanical extracts and amino acids mildly cleanse straightened or chemically treated hair. Eliminates excess dryness and adds extra volume. Pro-Keratin technology helps in reconstructing the hair texture. Additional Information : L'Oreal Professionnel believes in the powerful combination of advanced research and Professionel expertise to create products that your hair always wanted. Innovative products, tested and approved by the biggest names in hairdressing, L'oreal Professionel maintains the highest standards of quality in terms of performance, comfort and safety with an extensive range of hair care, styling and colour products that suit all hair types.